Anthony Ahmad (front left) and Kyle Ray (front right) with the cross-campus coalition. Like most teenagers, Cuyahoga Community College student Anthony Ahmad never really thought about the importance of voting while growing up. But that changed during his senior year of high school. Ahmad and fellow Tri-C student Kyle Ray want to impact others in the same way. It’s something they hope to convey to students and staff at all four Tri-C campuses in September with The Voting Experience. The two launched the project after being selected as national Democracy Fellows. Each received a stipend from Campus Vote Project, a national organization that encourages college students to be politically active and vote. The goal is to create a lasting project that encourages voter registration. The interactive exhibit they designed familiarizes students — many of whom are newly eligible to vote — with the process of registering, researching candidates and issues in a nonpartisan fashion, and casting their ballots. The third section will contain a registration table, at which students can register to vote, along with literature on nonpartisan websites for research on candidates and issues. Ahmad and Ray developed the exhibit with a core team comprised of Tri-C faculty and staff members including Mary Hovanec, Katie Montgomery and Jensen Hanna; a cross-campus coalition that included student life directors at each campus; and representatives from the Cuyahoga County Board of Elections. 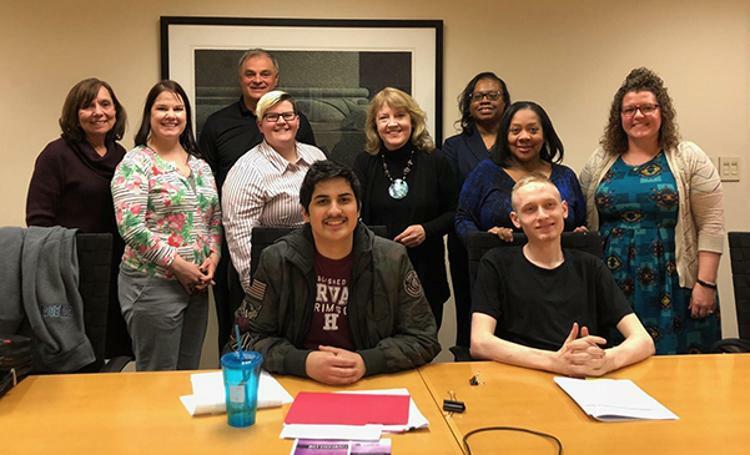 The students — who are part of the Jack, Joseph and Morton Mandel Scholars Academy — began meeting in February to develop a plan for the project. Faculty and staff involvement was instrumental in turning what was originally a simple idea into a much bigger concept. The interactive aspect is a critical element. The goal of The Voting Experience is to educate and familiarize, but Ahmad and Ray also wanted the exhibit to be fun and engaging — two things that young adults often don’t associate with voting. “We’ll also have popcorn, balloons and other small giveaways,” Ahmad said. Ahmad, Ray and the core project team selected September for several reasons — it’s at the beginning of the semester, two months prior to Election Day, and it’s the month of Constitution Day (Sept. 17) and National Voter Registration Day (Sept. 25). Tri-C received a National Voter Registration Day grant to help offset costs for The Voting Experience. More than 40 students have signed up to assist Ahmad and Ray with the project. The exhibit opened Wednesday at the Metropolitan Campus. Tri-C President Alex Johnson, Metro Campus President Michael Schoop and Claire Rosacco, vice president of government affairs and community outreach, attended, as did the Ohio coordinator for Campus Vote Project. In the end, no matter who or what you vote for, the main message Ahmad and Ray want to convey is the importance of exercising your right to vote.